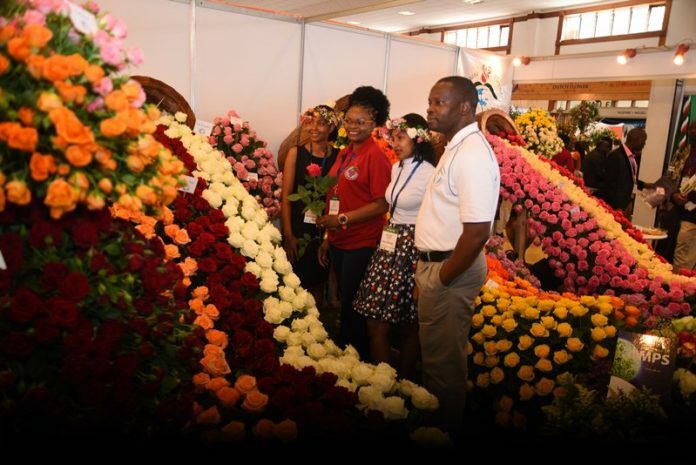 Was Magana Stand at IFTEX 2018 the best display of Kenya flowers? 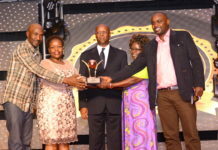 July 15,2018,Nairobi.When curtains came down on what has gone down as arguably the best flower show yet at the 7th edition of the International Flower Trade and Exhbition (IFTEX) in June, the big question out there, and still as fresh as the event is : Was Magana Flowers stand the best despite not winning an award? The show-stopping display of a canopy of flowers cascading like a water fall is yet to be explained but, what is indisputable is the stand was top among the most photographed, the most talked about, the best for a photo-op. So who is Magana Flowers? HortiNews takes you through the journey of the making of the farm. A few years after a breeder introduced a popular flower variety to the market, growers who initially expressed insatiable appetite for the variety would later uproot it in what they argued was its constant attack by pest and its vulnerability to botrytis and powdery mildew. Magana Flowers Limited however stuck to its guns and decided to carry on growing the variety. This tenacity would later pay off with the farm now being a prime exporter of the A1 variety that continues to excite markets, especially the Middle East. Such stamina is synonymous with the farm’s founding father Dr. Magana Njoroge Mungai who over twenty years ago saw a vision of transforming the then dairy farm into a horticultural farm exporting French beans and avocados before settling on a flower farm in what he believed was the right venture for his family and one that would create enough jobs for the surrounding community. Employing over 500 workers, the farm has positioned itself as a key player in Kenya’s blooming flower industry capturing prime global markets through the over 110,000 stems of roses that it harvests daily. But behind the radiant petals and alluring assortment of bouquets is the heartwarming story of the dedicated hands and technology that meticulously follows the flower from its nascent stage to maturity while ensuring the highest levels of protecting the environment. At the heart of this journey are cutting edge innovations that drives the company’s mantra of producing the best quality flower that meets customers’ demands at low cost. At the over 15 greenhouses that are spread across the 18 hectares are biological pest control methods that tackles flower’s most notorious pests. The yellow and blue sticky traps, cascading through the greenhouses traps both whiteflies and thrips, disrupting their cycles of reproduction. “We have gone big time into Integrated Pest Management which we use hand in hand with the conventional pest control methods. Sticky traps are very effective because they are about playing with the light spectrum of the insects. 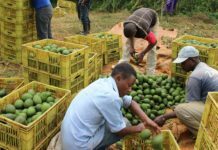 We have managed to cut pest and disease spread considerably with IPM,” said Lucas Ongere the Farm Manager. But so has hygiene at the farm which explains why the farm has managed to stick with the A1 rose flower variety even when the rest of the growers abandoned it. For starters the farm embraces the highest form of sanitation ensuring that leaves and dead plants are removed immediately they fall off. Routine prophylaxis treatment which include injecting fungicides to the flowers have been key in building resistance and helping them manage cold weather. It is done three months to the onset of the cold seasons. The farm has also invested in hydroponics technology, the growing of flowers without soil by making use of water with soluble nutrients necessary for the plant and inert media like coconut peat or pumice. The idea is to control nutrients taken in by plants, which would be hard to achieve through the use of soil. With water being a scarce resource, hydroponics allow for the recycling of the waste water. Magana has also gone big on water conservation and harvesting having installed five reservoirs that traps and stores rain water with a storage capacity of 160,000 cubic meters . The exercise has delivered instant wins for the company which has since April this year been relying on the water it harvested during the long rains to run the operation of the farm. But equally delivering gains has been the farm’s investment in green energy that has helped it cut operation cost by up to 90 per cent. Magana Flowers uses donkeys to transport flowers from the greenhouses to pack houses as opposed to use of tractors. The company is therefore able to scale back on the cost of diesel and maintenance. “Donkeys are low maintenance animals and we have really cut down on our transport expenses by using them. 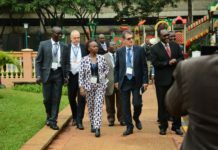 It has also meant that we remain true to our resolve of protecting the environment. The donkeys also eat grass meaning we don’t have to use lawn mowers which operate on diesel, further ensuring that we do not harm the environment,” Ogere added. Plans are in the offing to introduce a solar system targeting energy guzzling operations including pumping and activities at the cold storage. The company estimates it will cut up to 75 per cent of all energy cost once it goes solar. At the pack house, the final stages of the flower journey, nothing is left to chance with innovations like a unique spraying system complete with nozzles and unique chemicals ensuring that there is no room for diseases like botrytis that might strike. The unique chemical is sprayed in the pack house every evening lasting throughout the night and the next day. At the packing arena the seamless and harmonized operations of the people doing the sizing, bunching and sorting are credited with the high quality flower varieties from Magana flowers that markets have warmed up to. 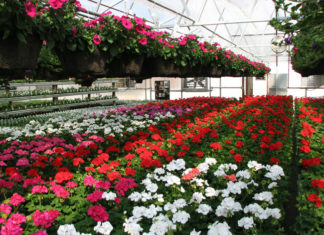 To further reduce chances of rejection and tracking the flower journey for purposes of traceability, the farm has an elaborate barcoding system that records the buncher code, which entails the name of the person doing the bunching, the flower variety, the date of bunching and the colour of the flower at bunching. The dates are also key in helping the sales team manage stock since the company uses FIFO, First In, First Out system. The detailed flower journey is credited with having produced 38 rose flower varieties that continue to excite the markets from the Middle East to Europe and China. Among the flagship varieties include A1, a large headed white variety that enjoys fanatical uptake in the Middle East, Revival, a pink rose large headed variety, that opens very well and has a relatively long vase life, burgundy, a large headed variety and Madam Red, another large headed variety, that opens very well and has a vase life of 16 days. The company has been struggling to keep up with the growing demand for its roses and is now looking at growing its cultivation area to 25 hectares. “Our philosophy at the company has been to produce the best flower variety at minimum cost. Markets have been so welcoming to our flowers which explains our idea of increasing the area under cultivation. We have also been reaping the benefits of accessing direct markets as opposed to going through auctions,” said Nicholas Ambanya the CEO of Magana Flowers. Going forward the company is looking at embracing innovation in producing flowers while reaching out to traditionally neglected clientele among them the youth. “We have to keep op innovative in order to surmount growing competition in the industry. We are looking at embracing concepts like the use of dried flowers for certain events and themes for example weddings, or anniversaries, The youth who identify themselves with most of these themes are also in our plan especially because they have been neglected in the business of flowers yet it is easy to win them over,” Mr. Ambanya added. When is the next IFTEX coming on. I need contacts of flower exporters to Ghana.